CAPS United and FC Platinum take title race to the wire! The Premier League title race will go down to the final day of the season after both CAPS United and FC Platinum registered wins. CAPS United beat Ngezi Platinum at the National Sports Stadium while FC Platinum thumped Highlanders 3-0 at Mandava Stadium. Simba Nhivi’s 35th minute strike was enough for CAPS United to remain in pole position when they got the better of Ngezi Platinum. CAPS United dominated most of the first half pinning down Ngezi Platinum in their own half and the pressure finally yielded results when Nhivi struck. 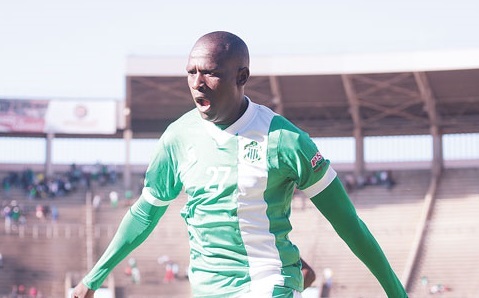 The second half saw CAPS United handed some anxious moments the biggest being a penalty shout late in the half when the ball seemed to be handled in the box but the referee ignored Ngezi Platinum protests as the Green Machine held on to win. In the 54th minute Gerald Takwara put the hosts in the lead when he smashed the ball into the back of the net. Highlanders protested arguing Takwara had handled before scoring. As the game proceded there was a heavy down pour of rain leading to fans running for cover but the match continued. In the 72nd minute Walter Musona doubled the lead when he took full advantage of a slip by Themba Ndlovu to go through on goals and score. There was an ugly incident in the 74 minute when FC Platinum head coach Norman Mapeza was struck by missiles from Highlanders fans who had taken cover near the VIP stand. Mapeza had to be treated and there was a brief stoppage in play as police tried to restore order. Highlanders could have pulled one back in the 86th minute but Prince Dube’s strike went just over. In the 90th minute Charles Sibanda wrapped up the win with a well taken volley to score the third. The scoreline puts FC Platinum on the same goal difference as CAPS United heading into the final game. 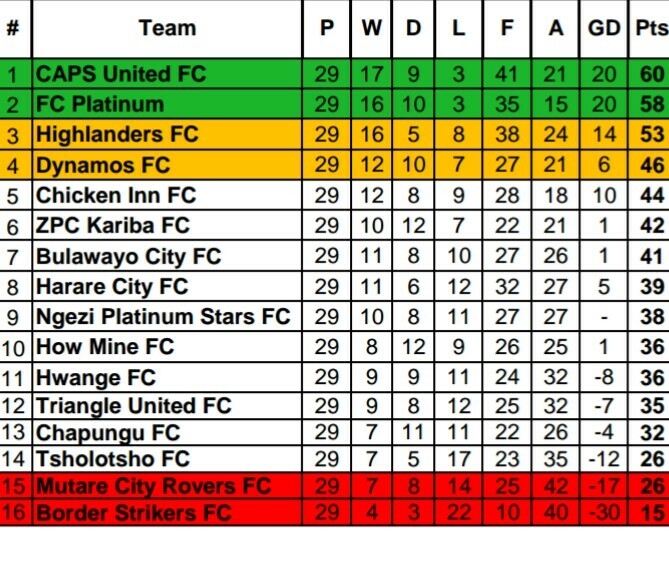 CAPS United still hold the advantage with a two point lead.CAPS United face Chapungu on the final day while FC Platinum will play against Tsholotsho. In other matches Godknows Murwira’s 76th minute goal was enough for Dynamos edge Triangle 1-0.Chicken Inn edged Border Strikers 1-0 while Hwange and Chapungu played out a goalless draw.